You may have seen an article by The Stranger earlier this week about how Cathy McMorris Rodgers continues to avoid facing her constituents. For a long time now, constituents have invited the Congresswoman to public forum events and town halls in her district -- and for a long time, Cathy and her staff have simply ignored them. Except none of that is true. As many people explained directly to Cathy this week, they are just constituents who want to hear from their representative in Congress. Now in a close race with Democratic challenger Lisa Brown, Cathy is in panic mode, and she’s attempting to build a record of holding town halls without actually having to face most of her constituents. How do we know that’s her goal? Because she has been holding a few “Conversation with Cathy” events around the district, but most of these events take place in the middle of the workday, and she gives very little notice to her constituents. This week it became clearer why she is trying to hide from constituents: her views are wildly out of sync with the views of the majority of her district. She gave cringeworthy responses to questions from constituents about health care, immigration, climate, and women’s health. And she showed that she does not represent the views of her constituents; she represents the views of the national GOP leadership. 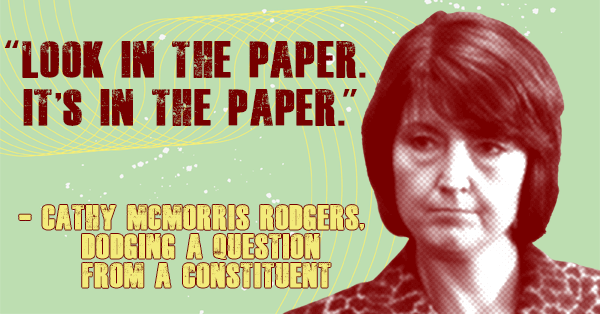 Cathy McMorris Rodgers’ allegiance and loyalty is to her party, not to the people she is elected to represent. "No person should be discriminated against because of who they are or who they love. Sadly, the fight for our rights never ends. 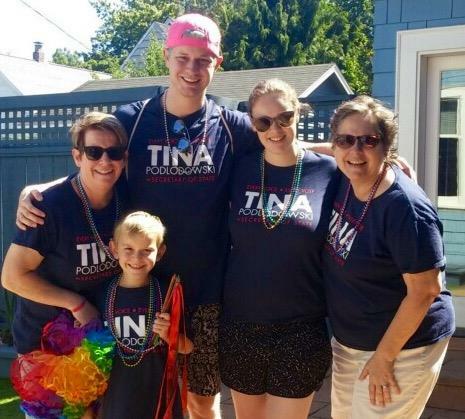 As the only lesbian State Party Chair in the country, join me, my family and my big, beautiful Democratic family in celebrating Pride Month!" Today wraps up Wear Orange Weekend, which started on June 1st -- National Gun Violence Awareness Day. The gun violence epidemic in our country continues to claim lives. The victims, survivors, and their families deserve to have their voices heard and their stories told. You know who’s not trying to promote gun violence awareness? Dino Rossi. He has been just as silent after the Santa Fe, Texas school shooting last month as he was after the Parkland, Florida school shooting in February. 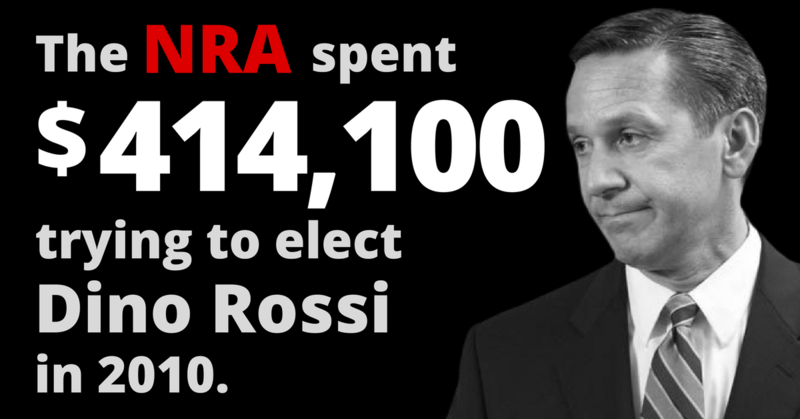 Rossi has taken massive amounts of money from the NRA, and it shows through his silence. The Trump administration has proposed implementing a domestic gag rule that would strip federal funding from health care providers who either perform abortions or who make referrals to abortion providers. The effect of such a rule would be to defund Planned Parenthood and other clinics that provide honest information to patients about the full range of reproductive health options, including abortion. Democrats like Senators Patty Murray and Maria Cantwell have been fighting back, exposing this plan for what it truly is: an attempt by Donald Trump and Mike Pence to defund Planned Parenthood. 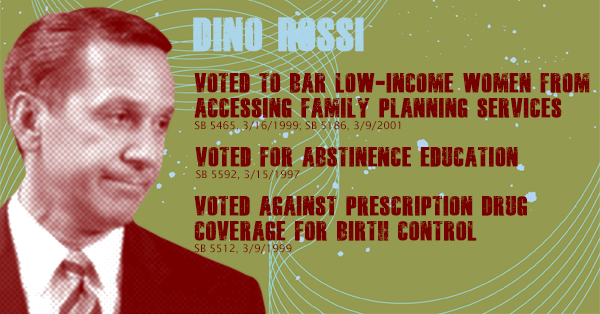 Surprise: Dino Rossi has been silent on women’s health as well this year. But it’s not hard to guess exactly how he would vote as his record for decades has been consistently anti-choice and anti-woman. Republican officials like McMorris Rodgers and Rossi have made it clear that they will obstruct women’s access to responsible health care. We need to elect more leaders like Patty Murray and Maria Cantwell, who will oppose this administration’s attacks on women at every turn. Democrats believe that we should make it easier -- not harder -- for women to get sound medical advice when they are making decisions about their reproductive health. You can help us elect more Democrats who will fight for women’s rights by making a contribution today. Are you a Democrat running for office this year? Need some guidance on how to maximize your campaign efforts? Then you’re invited to our Candidate Training during Convention in Wenatchee on June 15th. This event is co-hosted by the Washington State Democrats and the National Democratic Training Committee. The session will cover a range of topics, including fundraising, field, and digital. If you plan to attend, please RSVP as there is limited space! We’re constantly adding new merchandise to our official online store. These items make great gifts, or you can treat yourself to a t-shirt or sticker. Plus you’ll be helping us build a stronger Democratic Party! We need you now more than ever. Join Rise & Organize and help us keep the momentum, even as Republicans are organizing and coalescing around their candidates. We’re ramping up our organizing efforts across the state, hiring new staff, training new volunteers, and reaching more and more voters. And that’s thanks to small, monthly contributions from supporters like you. If you’re not already a Riser, you can join here. A few dollars a month will help us build our network of grassroots leaders and volunteers into a blue tide that will carry us to victory in November. 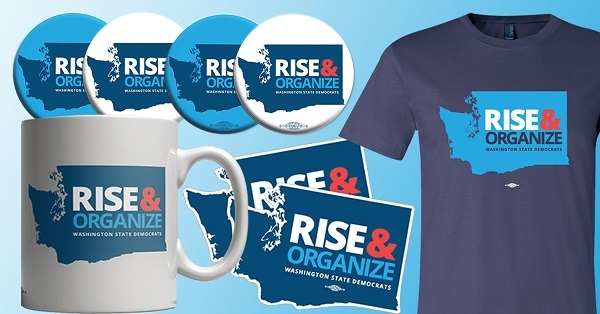 Plus you’ll get some new Rise & Organize gear when you sign up!